This issue is somewhat biased towards cruising and summer holidays. The current edition, and the previous one, were more or less produced at sea using the internet during what was supposed to be a break from the rigours of bringing you, dear reader, the up to date business travel news. The internet is the most wonderful of modern inventions. You either live with it. Or abandon it for two weeks! 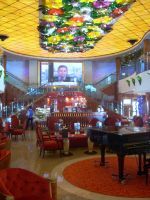 At sea it can be slow and expensive, an alternative the popular and cheap cyber cafes found at most ports. That is except Barcelona where the cruise terminal costs are worthy of a five-star luxury hotel and not nearly as comfortable. Sadly Barcelona is getting a reputation as one of the most expensive holiday destinations in Europe. August is a quiet month in the world of business travel. Why not try a cruise out of Southampton, have something of a rest and at the same time offer one’s services as a port lecturer, the other half suggested? Go Norwegian Cruise Line (NCL) ‘Freestyle’ advertised with up to 14 styles of dining. 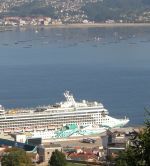 This year NCL scheduled a whole series to the Mediterranean on its newest ship, the 90,000-ton, 2,900-passenger Jade. At 25 knots and the latest in stabilisation the Bay of Biscay should not prove a problem. And such was the case. NCL introduced ‘Freestyle’ back in 2001 and after some initial teething trouble has refined the product. What it means is that you can dine at a time and place to suit you, within limits. The quality of food throughout the ship was excellent. You can book the same table and same waiter in one of the two large restaurants, or dine at a time to your convenience. There are two buffet style cafes and a 24-hour snack bar. Further alternative dining is paid for by way of a cover charge. Cagney’s Steak House provides New York cuisine at a price (the bill for dinner, drinks and a fine wine can come to $100 for two). There is the very popular Teppanyaki bar and adjoining Asian food area (cover $20 each), the Tex Mex hideaway ($10), a French bistro ($15) and an Italian eatery ($10). ‘Freestyle’ has now been extended to the final leaving of the ships. Choose your time and whether you want NCL to deal with your cases, or struggle yourself. It’s a nice little touch. Jade was built as the US-registered Pride of Hawaii for the mid-Pacific market. Let’s say that a combination of Union intransience, labour laws and the economic downturn meant that it has been transferred to Europe with a new title, a large casino, and one of the biggest emporiums afloat, even larger than the QM2. Some of the native artwork looks a bit out of place but in time no doubt it will be replaced and the past heritage forgotten. Hawaii has never caught on with Europeans which by all accounts is a pity. It is not as far as Australia. We took on a typical ex-Southampton 14-night summer cruise visiting Malaga, Civitavecchia (for Rome), Livorno (for Florence), Cannes, Barcelona, Gibraltar, Lisbon and Vigo. Eight port days and five at sea. For many a perfect balance. For us it included five lectures – including London and the Olympics on the way home across the Bay of Biscay. but the ship has more than sufficient space for everyone to find a spot to suit. Deck loungers never ran out in two weeks of nothing but sunshine. Let’s face it, the majority of passengers on this particular cruise are families, although there were plenty of couples of all ages, singles and those with mobility problems. The children’s programme caters for all from 2 to 17 in various groups. The under 12s need to be collected by their parents for meals and late night group babysitting is chargeable. The little ones have their own pool whilst one of the most popular items on board is a water slide. There is a small cinema for children and of course video games. The standard balcony cabins are well equipped with plenty of storage space and nice touches including slippers and robes, a hair dryer, and kettle to make tea or coffee. There is a 24-hour courtesy cabin dining menu, slightly limited but enough to keep the hunger at bay. A fridge is well stocked but you have to pay for anything you use. If you are on a tight budget the inside cabins are tiny but with the same excellent shower/washroom and Elemis soap and shampoo dispenser as elsewhere and you will sleep well without first light to disturb you. Try and keep away from the forward balcony cabins on deck eight which are restricted (see photo). Jade and her sister ships are all two-class ships although normal passengers for the most part would not know it, unlike the QM2, which has the Queen’s Grill and Princess Grill upmarket restaurants with certain lounge and balcony areas off limits unless in a suite. With Jade, part of the top two decks are given over to what is known as the ‘Courtyard Area’, a series of sumptuous cabins and a private patio complex complete with dip pool and sliding roof. Breakfast can be taken in your room or Cagney’s. Access is via a private lift and various privileges are available. You can live your whole trip in this opulent area, or descend from time to time to join in the ship’s activities, and in some cases link with the children and grandchildren. Jade does have a fine library but as to its contents we are not sure. For whatever reason it is not computerised. You have to sign the books out by hand, and the actual works themselves are displayed by author alphabetically. This is OK if what you want was written by Shakespeare but supposing your need is a historical novel. Where do you start. No data base. The very limited reference books are not allowed out, which is fair enough, and there is a small selection in five languages. Braille guests are catered for as well as children. The major stage shows are terrific, put on in a beautiful 850-seat theatre with fine sight lines. A six-piece live band supplies the music for the up beat performance worthy of the West End. There is also a series of speciality acts straight out of variety. What NCL offers makes some of its competitors look staid. Naturally there is a large and well equipped gym available 24 hours and also an open air sports court with spectator seating. You can practice your golf driving too. From seven in the morning until well past midnight there is always some kind of organised activity. Bingo and game shows may not be to everyone’s taste but there is no need to get involved. At least there are not promotional announcements every few minutes in a variety of languages. It is very much an English speaking vessel. The ship is very well laid out and never feels that large. The promenade deck is nearly one third of a mile round, flat, and with room on the starboard side for a very large chess set and various deck games. The crew are friendly, ever helpful, and there was a welcoming glass of Champagne upon embarkation but no Captain’s reception. Using the ship’s tenders at Cannes was a doddle, orange juice and water provided prior to the return. AERBT would have no difficulties in recommending Jade with one reservation. For 2010 the ship will be based at Barcelona which means a flight down on the morning of departure and likewise on the way back. This can be energy sapping if you have children, and even if you have not. It also means that one’s luggage is restricted. Now this is not altogether a bad thing. Cruising in the summer months should be informal and probably like most of his fellow passengers your Editor (and his wife) took far too much in the way of clothing. 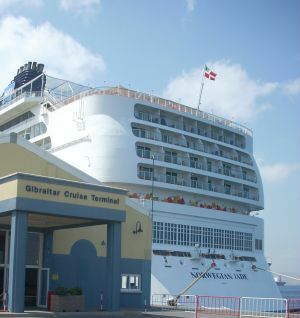 An alternative Baltic programme is provided out of Dover on sister ship NCL Jewel. Have we any complaints? Yes. Too many photographers and the Miami-based company really does have to think out its pricing policy for off ship tours. Whilst participants are guaranteed a return to the ship, rumours were that four ladies were left behind at Civitavecchia, the costs are far too high and even a last minute discounted three-trip package did not induce the rush expected. The British in particular are experienced travellers these days and a 45-minute E12 train ride to Rome will save a family many hundreds of pounds for a day out. Also on the negative side the competitive nature of the cruise business means that large discounts are available for the less popular shoulder periods. Drinks, alcoholic and non-alcoholic, are no longer cheap and British clients will find that the service charge is now $12 per day. With the Pound Sterling at around one-fifty as against two to the Dollar a year ago, the cost has effectively gone up by 50% in a little over 12 months. Add $336 to the cost for a couple. As to the lecturing. Great fun and an interesting way to meet fellow passengers. But it has it downsides too.